IntierraRMG, which specializes in mining-industry data collection and analysis, recently pointed out that the generally higher metals prices of the past decade have tended to lower the economic cut-off grade for most metals, and this has contributed to an overall decline in mined ore grades. This trend has been augmented by the introduction of larger equipment, which has lower unit operating costs. 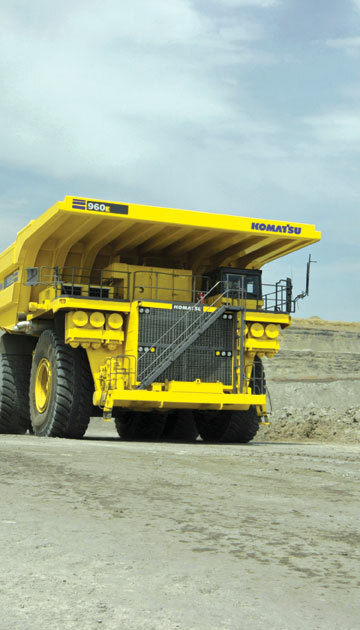 Nowhere, said IntierraRMG, is this more apparent than in the evolution of the “ultra” class haul truck, which emerged In 1996 when Komatsu delivered the 930E—first of a class of super-large mining trucks intended to help mining companies capture economies of scale at big surface mines. The 930E, with a 290-mt payload capacity, remains popular throughout the industry but has been superseded in capacity by haulers with much larger payload ratings. Komatsu’s 960E hauler, shown here, is the company’s current flagship ultra-class mine truck. Its predecessor, the 930E, was the first of the ultra-class haulers when it was introduced in the mid-1990s. IntierraRMG’s latest report, focused on Trends in Mining Methods, Technology and Equipment noted that, before 1996, the largest mining trucks in use had rated payloads of approximately 218 mt. That changed with the delivery of four of Komatsu’s 930E’s to copper mines in the southwestern U.S. Although Komatsu had gained a clear early advantage on its competition, first Liebherr (1998) and then Caterpillar (1999) not only introduced their own ultra-class trucks but expanded the range of payload capacity to 327 mt. In 2003, Liebherr again pushed the capacity envelope to 363 mt. By the end of 2012, there were more than 3,000 of these ultra-class trucks—classified as those with payloads of more than 290 mt—operating at 100 mines worldwide. This truck category now represents the fastest growing segment of the large-capacity truck market, defined as those trucks having payloads of 90 mt or more. As IntierraRMG Managing Director Peter Rossdeutscher said, “Shipments of these ultra-class trucks achieved early acceptance, growing from just the four delivered in 1996 to more than 100 units in 2000 and 2001.” By the end of 2002, the total population of ultra-class trucks approached 500 units, but they were working at only 37 different locations and accounted for only 6% of the global truck population—more than six years after the first 930E was commissioned. At that time, there were five major suppliers offering at least one model over 290 mt: Komatsu (from 1996), Liebherr (1998), Caterpillar (1999), Unit Rig (2000) and Hitachi (2002). The commodities boom and mining super-cycle that commenced circa 2003 brought with it a near decade-long growth in demand for large mining trucks, interrupted only briefly in 2009. Global shipments of 90-mt plus trucks increased from less than 1,000 per year to nearly 3,000 in 2007. The demand for the largest trucks increased as well, with the 282 units shipped bringing the ultra-class population to more than 1,100. But even more than 10 years after the class’ introduction, ultra-class haulers represented only slightly more than 10% of installed payload worldwide. Comparing their growth during the first five years of the mining and equipment super cycle (2003–2007) to the five previous years (1998–2002) shows a slower growth rate for the ultra class than for any class of large-capacity trucks.